Disgaea 1 Complete Review - HEY! HEY!! LISTEN!!! "We challenge you to a game of baseball, dood!!" Fifteen years and four releases ago, Atlus released a Strategy Role-Playing Game that, at the time, was unlike any other. 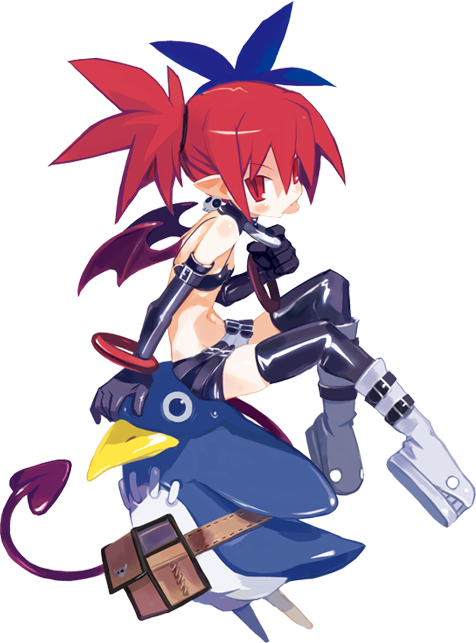 Originally titled Disgaea: Hour of Darkness, the first game of the series introduced players to the dark settings and quirky humor that Nippon Ichi Software is known for today. While Disgaea: Hour of Darkness inspired a number of spin-offs, sequels, and spiritual successors, none have yet to capture the magic of the original. Following last year’s release of Disgaea 5 Complete another appropriately named HD remaster, Disgaea 1 Complete. Including the HD visuals of the PC release and the treasure cove of content found on the PlayStation Portable, Disgaea 1 Complete could usher in a new generation of fans. Does this ABC Gum still have any flavor? Unlike most SRPGs which take place in medieval settings, Disgaea 1 Complete takes place in a literal hell. The story begins as the young prince of the Netherworld awakens from a two-year slumber. After a rude awakening from his vassal Etna, Prince Laharl learns of his father’s untimely demise (choking on a pretzel). As the king’s only son, Laharl wastes no time declaring himself the rightful heir. In light of his recent absence, however, the demons of the Netherworld ignore this claim and each set out to seize the throne. Protecting not only his life but his birthright, Laharl sets out to vanquish the competition. Initially, everything goes as planned. After defeating a lowly Mid-Boss, Laharl returns to his castle to fight another day. 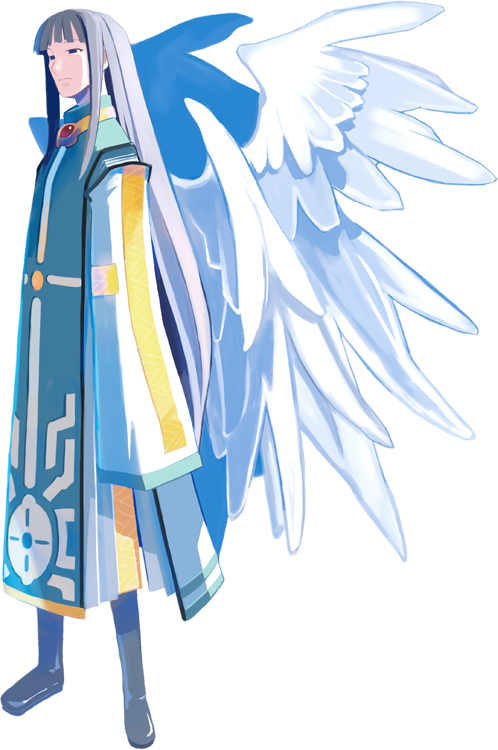 It is here that he crosses paths with angel trainee Flonne. Sent to assassinate the already dead King Krichevskoy, Flonne instead finds herself stumbling into the young prince’s room. After losing a game of cat and mouse and summoning a dragon, Flonne learns from Laharl that the king has passed. Pure of heart, Flonne finds it unbelievable that Laharl would not mourn his death. Aiming to prove that even a demon can love, Flonne decides to stay by Laharl’s side. It is here she can best fulfill her mission: to remove the threat one way or another. The story of Disgaea 1 Complete is by no means a complicated one. In fact, it feels like a Saturday morning cartoon. Laharl travels around different levels of the Netherworld hunting his fellow demons. Each chapter there is a new enemy that does their very best to get in his way. What makes this game so enjoyable is its comedic approach the subject matter. Whilst battles of demons and angels make up the Book of Revelations, Disgaea never comes off as too serious. Rather, it takes any opportunity to gets to laugh at itself and other common troupes. While it is a fun way to enjoy the story, things can be predictable compared to the average JRPG. 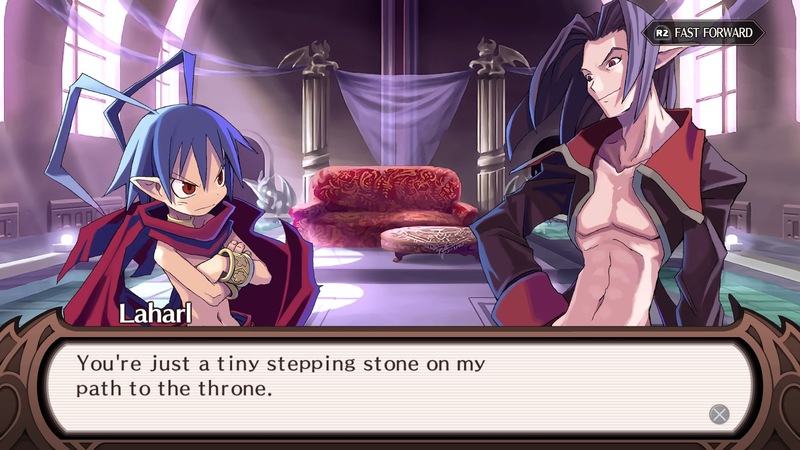 Where Disgaea truly shines, however, is its character development. There is a reason why Laharl, Etna, and Flonne have returned in every sequel thus far. Laharl is the main character and he knows it. Flaunting his title of prince and his (once) great power, Laharl is truly one of a kind. While this sort of character sounds unpleasant on paper, the game’s execution is surprisingly endearing. His now iconic appearance mixes that of a protagonist and antagonist, representing his own grey morale. Etna starts the game by almost killing the sleeping prince. In fact, if playing Etna Mode, she may very well succeed. From her earliest interactions, it becomes apparent that she should not be trusted. Of course with her ability to groom Laharl’s ego, this is not something he takes notice. Flonne, on the other hand, only seems capable of seeing the best in people. Bringing an adorably optimistic personality to the trio, she perfectly compliments her demonic friends. 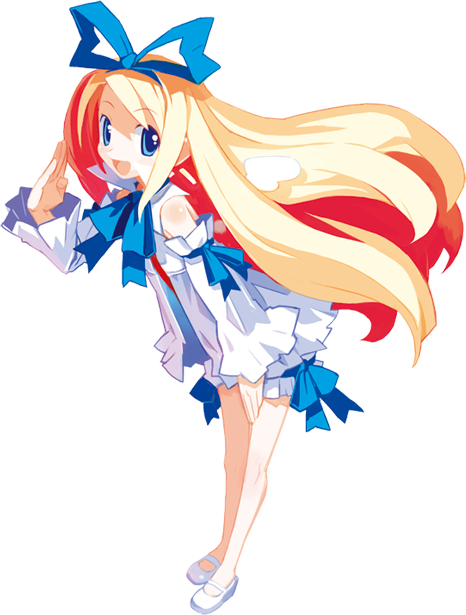 While the game doesn’t waste a chance to prove her innocence, Flonne’s over the top personality fails to ever become an annoyance. 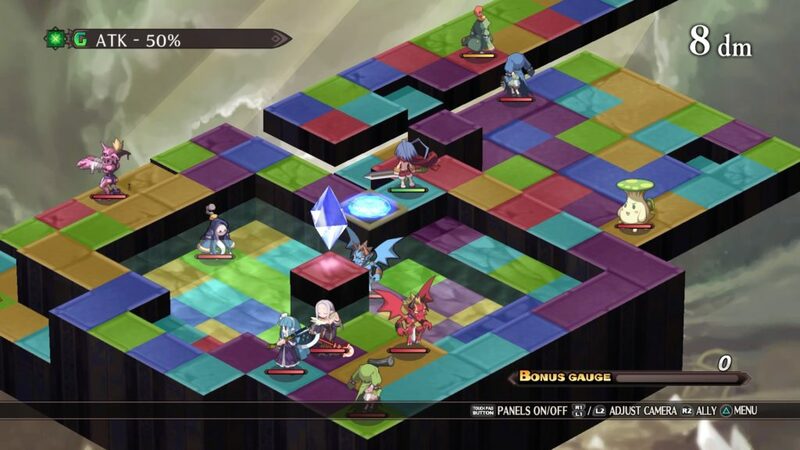 Originating on the PlayStation 2, Disgaea 1 Complete features a traditional grid-based field with a 2.5D design. This makes the core concept something like NIS America’s other recent release, God Wars: The Complete Legend. Characters on either side fill up the map and take turns beating one of the other. This system has been proven to work effectively, even over time. The only common issues are odd camera angles that can be difficult to bypass. What makes the gameplay unlike any other are the special commands implemented within the battle system. The most notable of these include Lift and Throw. While they may both sound rather straightforward, it adds a surprising level of depth. Prinnies and monsters aside, each player character has the ability to lift another. Whether the second party is friend or foe, up in the air they go. This leads to a plethora of options. If holding an ally, for instance, players can Throw them across enemy lines and even over the untraversable terrain. This is especially useful while fighting more difficult enemies such as Flonne’s pet dragon early into the game. Just don’t forget that Prinnies explode when thrown, damaging all parties within range. Perhaps even more useful than tossing other characters is the ability to move around Geo Symbols. Geo Symbols appear on most maps and can feature an array of effects. While some offer no ability at all, others can drastically turn the tides of battle. From Warp to Invincibility, the affected Geo Panels should always be taken into consideration. Geo Panels are each represented by a handful of colors and share the abilities of any Geo Symbol placed on said color. As fun as that sounds, sometimes you are better off simply destroying them. When destroyed, the Geo Symbol will inflict damage on any character standing in the same color. This will also take out any strategically placed Geo Symbols to create a domino effect. When executed correctly, entire floors of enemies can be whipped with a single stroke. For now and forever, Laharl, Etna, and Flonne stand tall as Disgaea’s leading man and ladies. Disgaea 1 Complete, in particular, revolves around these three predefined characters. 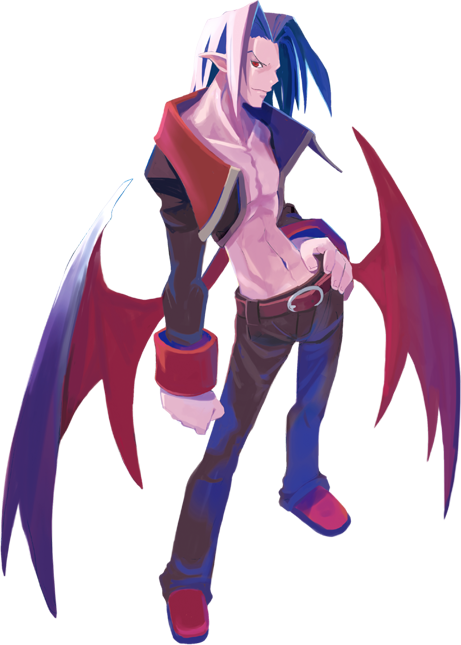 Aside from Etna and Flonne, however, Laharl’s party will mostly be made up of custom user-defined characters. Any player character has the authority to address the Dark Assembly. By doing this they and take on a pupil. This pupil comes in the form of a new character. The basics such as name and class can be selected for each new party member. From Fighters and Archers to Mages and Clerics, each brings a slew of styles to keep things interesting. With the ability to let every character wield any weapon type, no two parties will ever be alike. Disgaea: Hour of Darkness originally released back in 2003. Since then, the series looks practically the same. Most JRPGs have made the transition to 3D design in recent years. Final Fantasy, Dragon Quest, Pokemon, even Fire Emblem will soon be making that plunge into the 3rd Dimension. Meanwhile, Disgaea as a series has chosen to favor traditional 2D sprites after all this time, and we couldn’t be happier. Though working in the 2D realm, Disgaea 1 Complete is easily one the prettiest SRPGs on the market. In terms of story and gameplay, Disgaea 1 Complete is a direct port of Disgaea: Afternoon of Darkness for PlayStation Portable. Where it varies most is in its graphics. For the first time on console, Disgaea 1 Complete offers a mess of High Definition sprites. We aren’t just talking about mains. Each character has been visually upgraded with sprites worthy of even Disgaea 5. Each sprite is worthy of being its own static art. However, when combined they have the power to bring characters to life like never before. Laharl has never looked better as he begins his reign of terror. The character sprites are not the only game assets to undergo an overhaul. 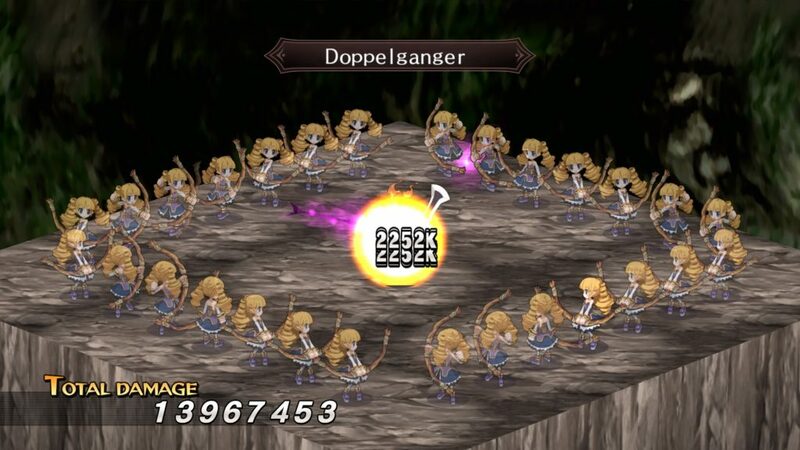 Disgaea 1 Complete features a large number of updated animations and effects. These include everything from simple battle animations to the series’ iconic and over-the-top skills. Considering the fact that Disgaea‘s attack animations are some of its strongest features, this is good news indeed. From Laharl’s Blade Rush to Etna’s Sky Lunge, there’s never a dull moment in this battle for supremacy. While the PlayStation has always been the home of Disgaea as a franchize, it is nice to see it look this good on a Nintendo system. Disgaea 1 Complete certainly has come a long way since Disgaea DS. 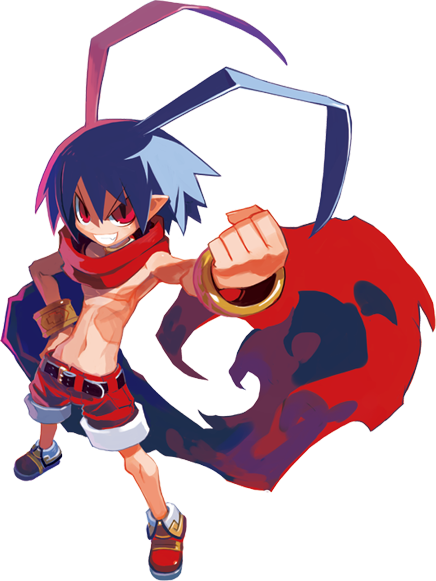 At this point in time, Laharl, Etna, and Flonne have become household names for any SRPG enthusiasts. Luckily, the voice actors behind each of the characters have remained mostly unchanged. For those unaware, Michelle Ruff did replace Amanda Winn-Lee for the part of Etna for each of the game’s sequels and re-release. 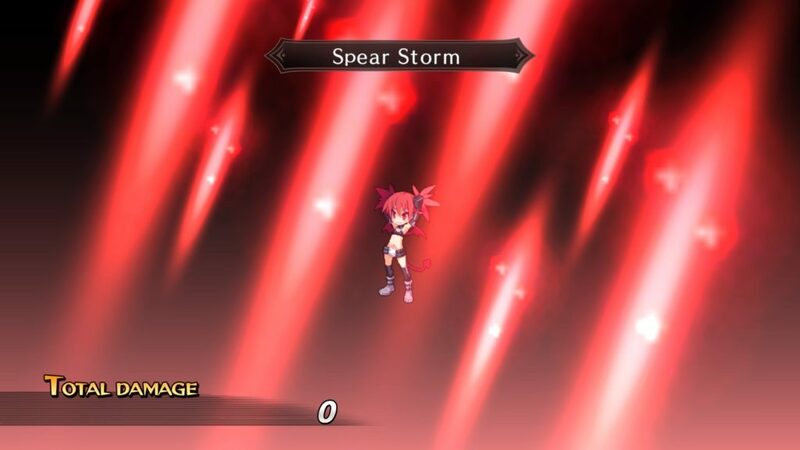 While the most avid Disgaea fans may seem this as a deterrent, Michelle Ruff does a fantastic Etna impression and has had the role for quite some time. Likewise, Barbara Goodson and Sandy Fox perform wonderfully at their returning roles of Laharl and Flonne respectively. For those interested, the Disgaea 1 Complete also includes the original Japanese dub. Either way, players will likely enjoy what Laharl and party have to say. Counting Disgaea D2, Disgaea has a total of six main games. While the series has continued to add new and zany tracks to the series’ score, few have been able to top the originals. To this day, “Welcome to the Dark Castle” and “Ode to Laharl” are catchy as hell (pun quite intentional). My personal favorite track, “Go Little Girl!” plays during some of Flonne’s best scenes. It is easy to see why a Music Shop was added in-game. Once obtained, these tracks can be heard within the Music Shop or an Item World dungeon. There’s nothing more motivating than setting your own BMG. It is only a shame how expensive to unlock these tracks can be. Overall, Disgaea 1 Complete is the penultimate Disgaea release. It takes everything loved and cherished from the previous releases and splashes in some HD visuals. With a level cap of 9999, it is easy to see how one can get lost in all the game has to offer. Whether you be a returning overlord or a Prinny noob, this is one SRPG that should invade your radar. Did we mention that its out right in time for Halloween? HEY! HEY!! LISTEN!!! gives Disgaea 1 Complete 9.1 Prinnies out of 10.